← who needs a table? 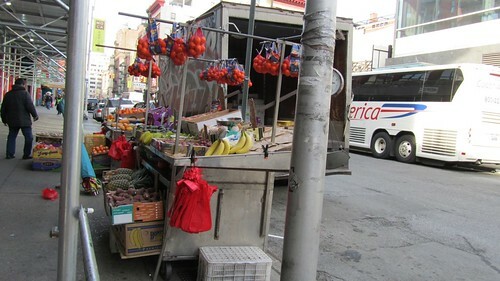 I saw this amazing fruit vendor in Chinatown recently and couldn’t help but marvel at the beauty of it. Here it was under some scaffolding of a building that is going through some kind of renovations, as they all seem to be sometimes. The stand was tucked away from the main hustle and bustle of Chinatown where one is likely to find things like full duck carcasses in windows and people selling their wares tchotchkes out of what literally amounts to a closet that opens to the sidewalk. These vendors often don’t even fit inside their stores and yet they are stores. This vendor in particular had about two tables worth of stuff he must have been dropped off nearby then he would have had to wheel it over onto the sidewalk and set it all up for us to peruse at our leisure. I didn’t buy anything but i did snap a few photos before I went on my way. The determination of the entrepreneur in this city is definitely something awesome. For a concrete jungle New Yorkers enjoy some of the freshest and most readily available fruit and vegetables. As you approach a newspaper stand to buy a candy bar you are likely to be in walking distance of a street vendor with a healthier apple waiting for you. 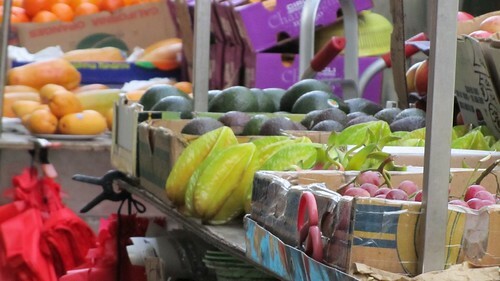 In fact, when I go grocery shopping I often intentionally don’t buy vegetables so I can have my pick of several fruit/veg vendors on my way home. This entry was posted in everything i've blogged, food, observations and tagged chinatown, pretty, walking. Bookmark the permalink.